Something has happened in the last couple of decades that hasn’t happened since the influenza epidemic of 1918: large reductions in life expectancy for sizable demographic portions of America. As reported by the LA Times, a study by the Institute for Health Metrics and Evaluation at the University of Washington found that women in large chunks of America are not living as long as they did in past decades, such declines in longevity said to be extremely rare in industrialized nations. Overall, life expectancy increased for Americans during the period (1987-2007), though at a pace that continues to lag behind that of other modern, industrialized countries, where universal access to health care long has been available. 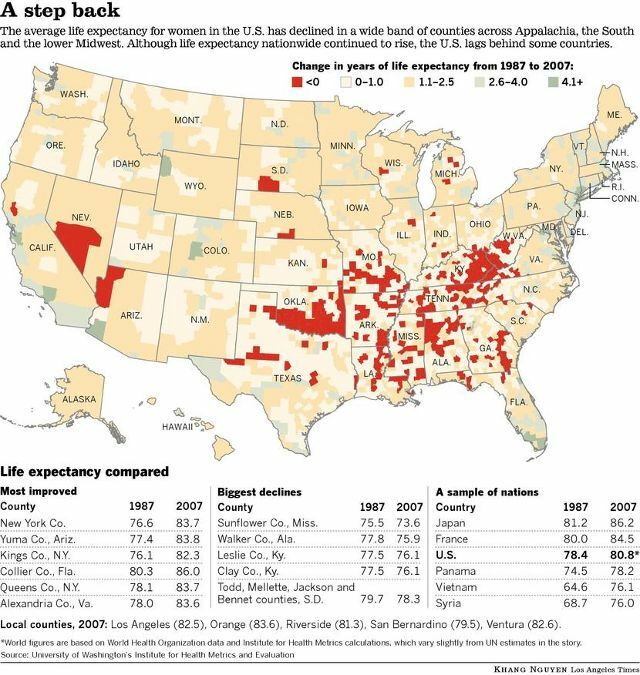 The unhealthiness appears concentrated in the lower Midwest and Deep South, traditional red states in recent times. The reasons for this unhealthiness are at most indirectly political. But they aren’t entirely insignificant either, nor irrelevant to overall concerns about America’s system of healthcare. While diet and smoking are two prominent factors cited as causal factors in those parts of the country affected, there are other factors tool. One is the extent to which state and local governments make an effort to supplement private health care, blue states and blue state localities more likely to support activist government. Poverty is a factor as well, and outside of pockets of urban economic distress in large cities, the rural South and Midwest tend to be the most impoverished. Perhaps less obvious is that social institutions, government and professional experts are less shy about urging reforms designed to make the population healthier in metropolitan areas and more progressive regions. Likewise, residents of these same areas are more receptive to the advice of experts, or perhaps simply less resentful of being advised. Longevity in New York County increased the most of any place in the entire nation, an area with a strong government role in the health of its citizens. New York was an early practitioner of regulation of food ingredients in restaurant fare, and of forcing transparency regarding nutritional information for items on the restaurant menu. The study is noteworthy for the nation as a whole, reaffirming once again our dubious distinction as a nation spending almost double the percentage of GDP as other nations, with less effective health outcomes for all the money spent. Presently the United States spends approximately 17% of its gross domestic product on health and insurance, while the remainder of the industrialized world, with universal systems, spends around eight or nine percent. The recently enacted health reform measure addresses some of the more egregious flaws in the current system, and does attempt to curtail the staggering rise in health costs. -For combined male and female life expectancy, the ranking of the United States is currently 49th . -America ranks 30th in infant mortality rates; infant mortality in the United States is 36% higher than in Britain. -The United States has approximately 2.5 times the average years of potential life lost due to diabetes. –20% of Americans say they have delayed or postponed medical care in the past year. -21% of U.S. adults expected to have difficulty paying for health insurance or healthcare services in the next three months. -24% of people who canceled or postponed care said cost was the primary reason. -54% who skipped care said they missed a doctor visit. Eight percent said they delayed or skipped medical imaging of some sort. -18% of American physicians said they sent computerized medical reminders to patient, compared to 93% of physicians in New Zealand and 83% in the United Kingdom.